Took these next photos on a quick jaunt into Belfast the other day. 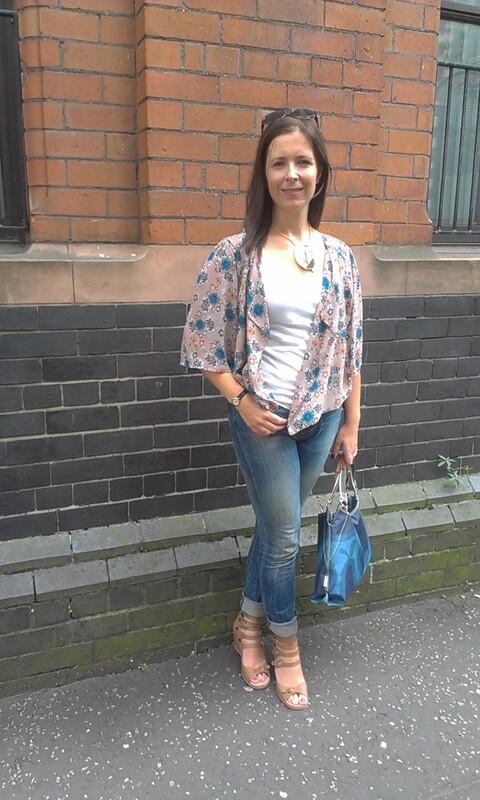 It was a nice day but not warm enough for just this kimono top if I'm honest - I braved it all the same as it was too pretty to cover up. I've worn it before on the blog - it's such a pretty top that transforms a jeans and t-shirt, in much the same way as a scarf I guess. I love the colours in it although I've struggled to find a vest that matches exactly but the cream works well enough I think. 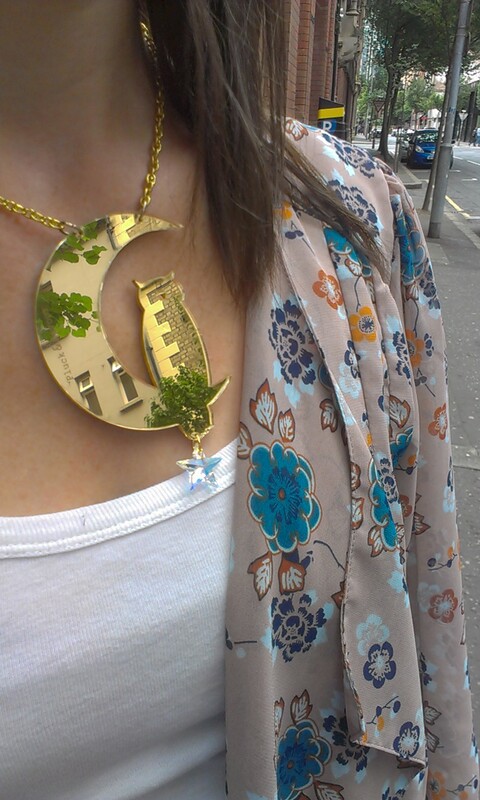 It needed something to bling it up though so I opted for my Pluck & Devour Owl & Moon pendant in mirrored gold perspex. This has been such a versatile piece. I worried I wouldn't wear it much but because it's plain gold and not coloured, it works with so much. It also gets lots of positive comments when I wear it. Every shop I was in that day, someone complimented it. Hubby enjoyed photographing it with various things on the reflection...as I shivered on the footpath! Right - off now to pack for the weekend. I'm thinking a bit of black, some neon, some heels, and those reliable Maison Scotch jeans, which I can't get enough of at the moment...sorry if I'm boring you with them. Hope you have a good weekend - if you're in the UK, enjoy the bank holiday and if you're in Ballintoy, Co Antrim...beware the hens! Hope you have a great time on your hen weekend Avril. I'm sure you will. I'll be pretty much copying you tomorrow night. I'm going to wear my little kimono jacket as well for going out. Hope the weather plays ball and is nice and warm for my little outing. Shame about the boots - they're lovely. Super cute necklace, I love that! Enjoy your hen weekend - I can't remember the last one I went on! Have a great time Avril - I look forward to seeing what you wear. I love your outfit and you look really young in these pictures! Best wear that outfit/hubby taking photo's again! 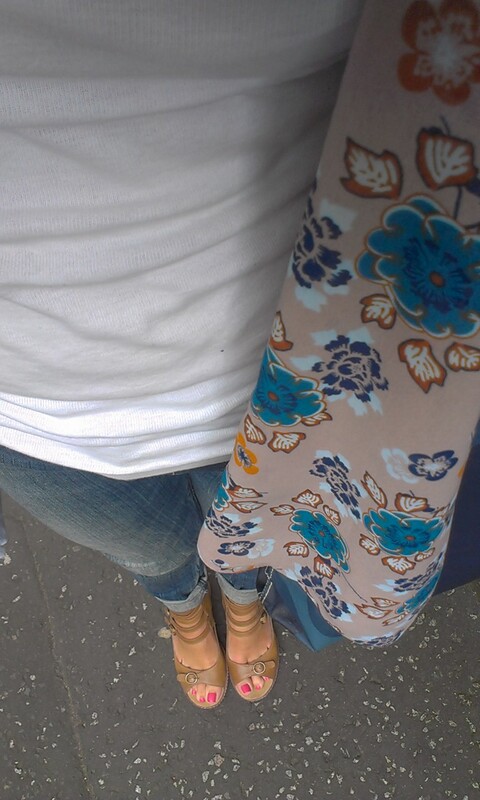 Great great outfit, think its my fave so far!!! 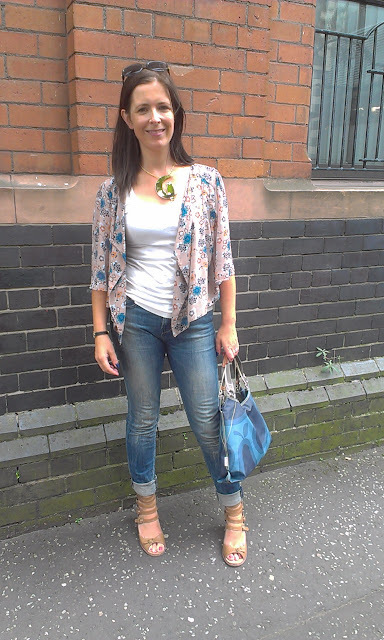 The drap and colour of the top with the jeans and that fabulous necklace!